I’m so excited to introduce you to Chris Kapono today. She’s another one of the awesome teachers from the 2015 Polymer Clay Adventure. Chris has a fantastic eye for texture and creates gorgeous organic looking items. Many of her texture tools are readily available in big box stores or online stores as well. Thanks for joining us today, there is much more fun planned from other polymer clay artists coming up in two weeks. Don’t miss it. Sign up for the emails here. And now … let’s see what Chris has to say! An artist friend of mine turned me on to these handy tools and they have been a staple on my work bench ever since! They are so versatile and can be used in all sorts of ways. They come in a set of three graduated sizes. One end is a smooth steel ball and the other end has a rubber tip in various shapes. I use them to hammer texture onto the surface of the clay, poke holes and divots and more. I am still discovering new ways to use them. They are great for smoothing out fingerprints as well. They are one of my gotta have it tools! Rubber stamps and texture sheets are a wonderfully easy way to add texture to your project. There are tons and tons to choose from and some well known polymer clay artists have even designed some of their own made especially for clay. Try to find a stamp that will leave a good deep imprint. It is a good idea to spritz your clay lightly with water before stamping to prevent the stamp or texture sheet from sticking to the clay. You don’t have to spend a ton on items for texturing clay. 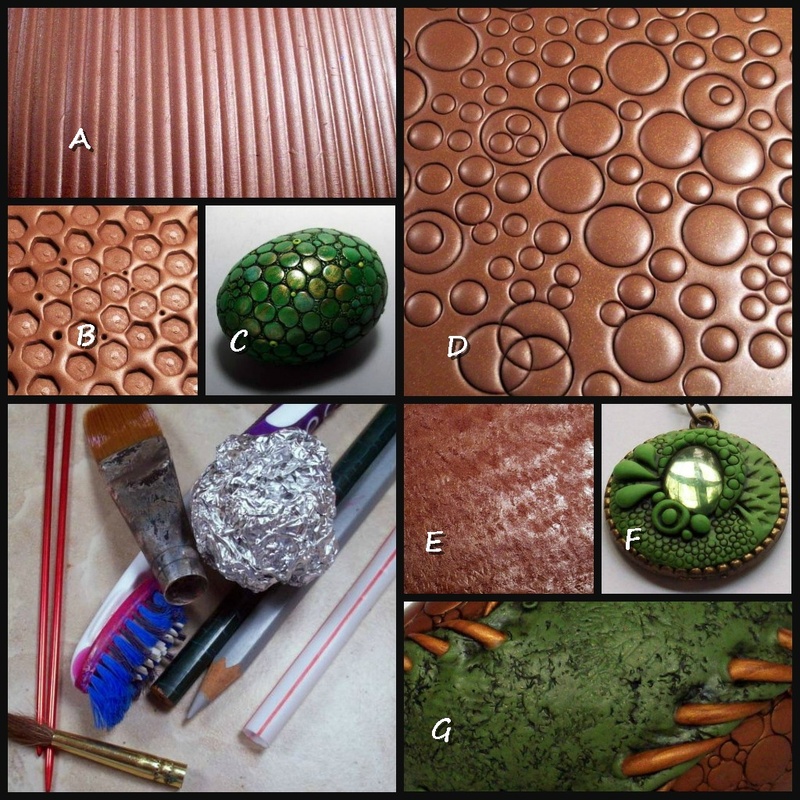 In fact, you can create some awesome patterns and surfaces using things you probably already have at home. Pencils, ball point pens, old toothbrushes, drinking straws, knitting needles, aluminum foil and old paint brushes to name a few. Play around with various things and see what happens when you stick or squish it into polymer clay! Just remember that, once it is used for clay, it cannot be used for food any longer. I have some examples in my photo. A) this was simply a drawing pencil rolled across the clay. Awesome ripple effect. B) this pattern was made by poking the un-sharpened end of a sketching pencil into the clay. C) I created this scale effect with a drinking straw! D) I don’t take real good care of my paint brushes and sometimes the brush end falls off the wooden handle. Oops! This actually turned out to be a good thing as I discovered the metal piece that holds the bristles makes a great tool for impressing circular shapes into the clay. E) this fur like texture was made by tapping the bristles of an old toothbrush on the clay. F) I created the fine little circles on this pendant using the clear plastic sleeve that some of the super fine paintbrushes come with to protect their tip. G) this rough surface was created by crumbling a sheet of aluminum foil into a ball and rolling it around on the top of the clay. So easy! I found an old lace doily and almost threw it away but I stopped myself and asked the obvious question- what would happen if I squished this onto my clay? The result was a wonderful texture that I have used in all sorts of ways. Any type of old fabric with a rough or interesting surface, such as burlap, can be a great way to add texture. Fold or wad it up or tear it here and there and see what happens! The thrift store may be a great place to find interesting textures for use in your clay. This is becoming my all time favorite source for interesting surface textures! Bark, pods, stones, shells gourds, walnut shells, sticks, even leaves with prominent veins are awesome as well. Think of them as nature’s stamps. :) To protect your clay from bits and pieces of grit and grime you can lay a thin sheet of plastic wrap over the top of your clay before pressing in that awesome piece of bark you found. Don’t like the result? Just squish up your clay and try something else! Well there you have it. My top five sources of awesome texture. I hope you have fun discovering all the wonderful ways you can add interest and detail to your work! 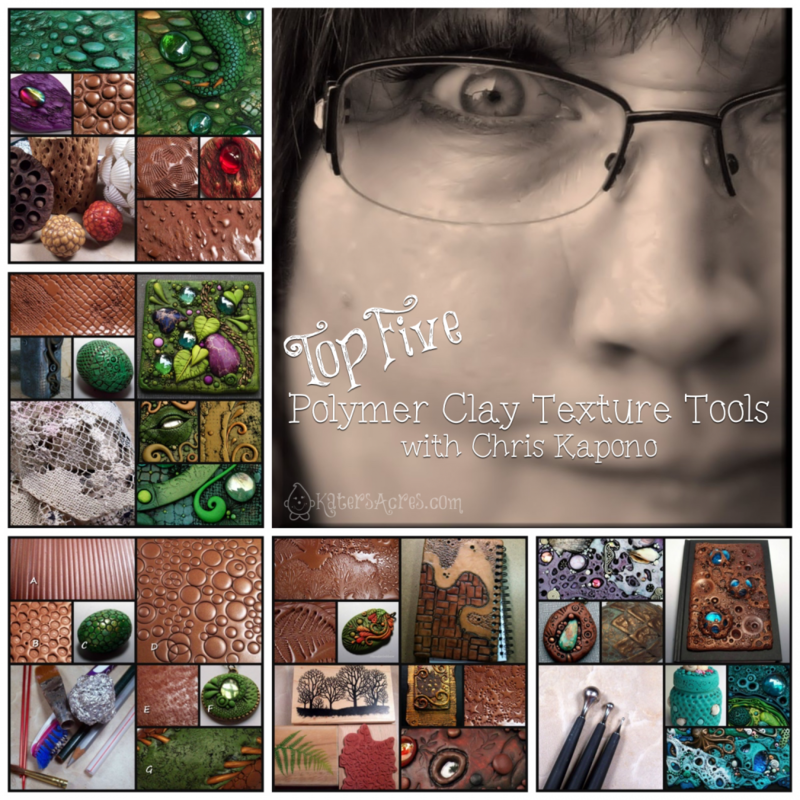 Join me throughout the summer months as guest polymer artists from around the globe share some of their “Polymer Clay Top Five’s.” Guest writers have chosen their own “top five” items, they have not been paid or sponsored in any way to promote their favorite items. Thank you, some very good tips. i will follow your site!